Rental Price $3.95 includes your choice of organza sash color. Satin sashes are available at an additional charge. Set up & Delivery fees may apply. Chair Covers are available in Black, White, Ivory or Chocolate Brown. 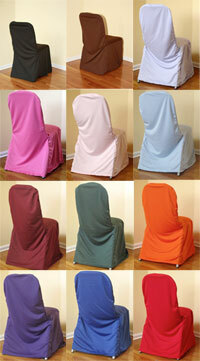 CHAIR COVERS AVAILABLE IN NEW COLORS! Starting at $5.25 per chair in the following custom colors ($3.95 pricing still applies for the White, Ivory, Black or Brown covers). New Colors include Burgandy, Fushia, Hunter Green, Periwinkle, Lavender, Orange, Periwinkle, Purple, Red, and Royal Blue.